I do like snow a lot, I’m just not so keen on falling over when it’s icy. I definitely need to buy some new walking boots; because although they are still smart and comfy, my leather Timberlands are a bit worn and shiny on the soles. It makes me very wary walking the day after snowfall, when everything’s frozen solid. Last year I ended up making the shape of a capital A, with my hands flat on the pavement in front of me and my bottom in the air, when I slipped on the ice! No one needs to see that again. At the beginning of the week I’d driven Mum around to four shops to try to buy a couple of small brown loaves, as I wasn’t planning on baking any sourdough for a couple of days. The snow had been forecast and it seemed sensible to make sure she had some. We found they were all sold out nearly everywhere. In the event it was a wet kind of snow and so didn’t hang around. By Sunday, when we went for another walk, it was beginning to melt at the edges. Snow days means soup days. I made a new recipe from Olive: Creamy Tomato Soup. It’s a delicate blend of flavours and went down well with the others, though personally I’d halve the quantity of cream, it was a little rich for me. I don’t have the same comments about the chocolate in the cake I had last Monday, courtesy of John Lewis rewards on my app. Get the app if you ever go anywhere near a JL. The free cake and hot drink can be perfect, when you’re shopping and in need of a pitstop. What I love about it is the free cake includes pastries, which means you can have a rather nice cheese scone! This was a rare time when I actually had the cake and a cappuccino, rather than peppermint tea and a cheese scone for lunch. 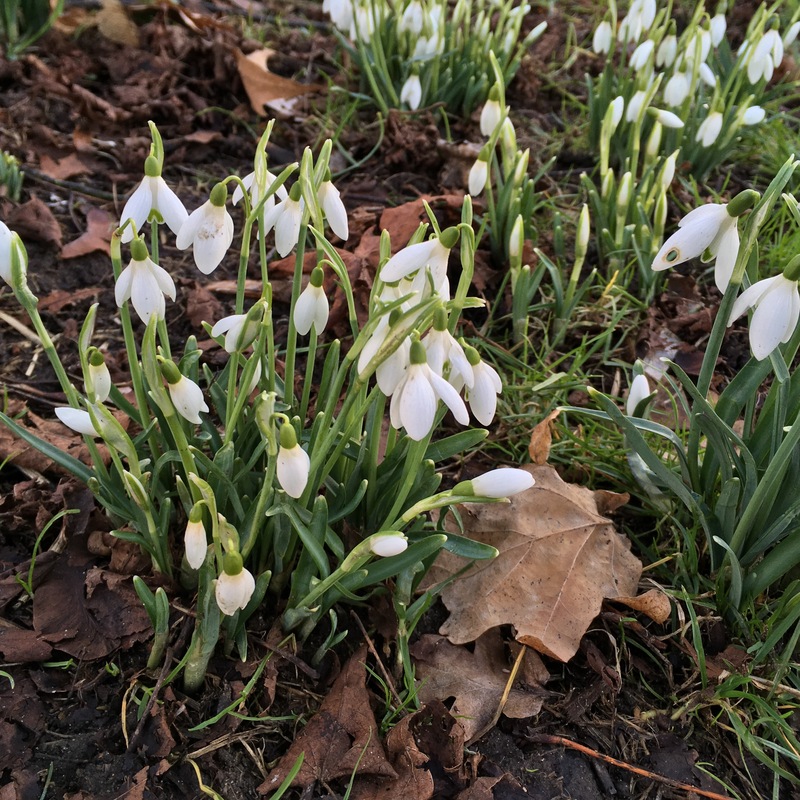 Now I know daffodils, snowdrops and hellebore are winter flowers, croci too, but just seeing flowers popping out and nodding their little heads can’t help but make you think of spring. By Wednesday it was hard to believe we’d ever had any snow at all. Did you spot the foraging ducks amongst the fallen beech leaves? They were too busy to turn around to chat to me even, though I did try to start up a conversation. Look at that handsome strutting boy heading back to the pond, he was all wiggling hips and attitude as he knew I’d snap him. Friday morning and I made cheese scones for lunch. Oops I forgot to start the timer, so they were rather more crispy than usual, which actually went down really well. Good! Then lasagne for dinner. This one. Absolutely yummy, a proper Winter Warmer with bells on. A robust Malbec to sip and the promise of some chocolate after. If you’re not going anywhere Friday nights are made for a tasty meal, which has to fit within the criteria of a Friday Night Tea, there are rules about what constitutes a Friday Night Tea and definite no-nos. Do you know what I mean? I was delighted to find out a friend thinks exactly the same way, that made me realise how in sync we were when we started to get to know each other. You also need a good film, or tv which makes you laugh, nothing serious, and the evening has to include a little something sweet for later. No dessert or chocolate to hand is very, very bad. It’s not all food, drink and chocolate cake, as lovely as that is. My weekly tally, added to my accumulative total showed I’ve completed over a tenth of my walking target now. I’m aiming to walk 1,000 miles this year, without pressure or in competition with anyone else. Over 100 miles walked already. Go me and my shiny bottomed Timberlands! What about you? What are you doing, cooking or making in your spare time? Have you read any good books lately? I am absolutely stuck into Last Letter Home by Rachel Hore. It’s going to be a quick read for me as I can’t put it down. I’ve darned one side of my ripple’s ends and so have been ‘allowed’ to knit quite a bit. Do you do this kind of trade-off too?! There’s a mistake in the scarf pattern. I’ve realised that if I k1, *yo then k2tog* repeat to the penultimate stitch, then k1, the stitch number doesn’t decrease. The two instructions might have been transposed, which is why my 72 ended up 66 and still decreasing, last week. I ripped it back on Monday and now feel happier. I am a perfectionist and hate knowing I could do something better or just properly; bodging isn’t great! I’ve contacted the wool shop to say about the typo, admitting I’m not the greatest knitter in the world as I might be wrong anyway. I’m still listening to The Silent Tide by Rachel Hore. It’s a good darning and knitting companion. The story is hotting up and I’m feeling intrigued about Isobel…plus is Hugh the great writer and man we think he is? My other books are Feel the Fear and do it Anyway by Susan Jeffers (a classic read with something uplifting for everyone) and Apple Tree Yard by Louise Doughty. I wanted to read the book before seeing the BBC’s 4 parter. 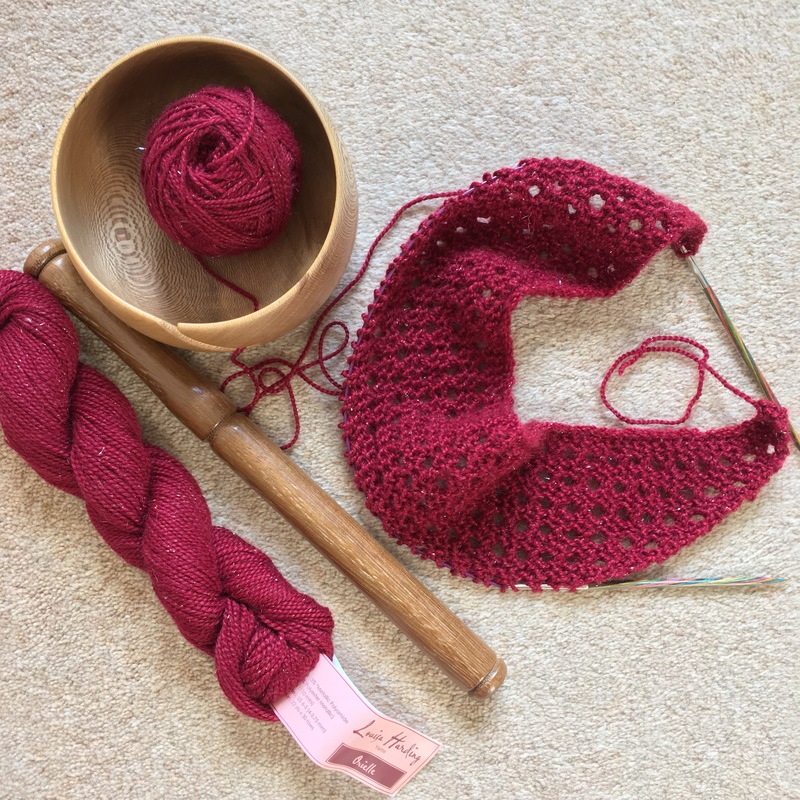 I’m joining in with Ginny’s Yarn Along once again. I really like seeing what people are making and reading. But now it’s back to grey and drizzly. Oh well, you have to make the most of the blue sky days and sprint outside when you can. I have given myself permission to start something new, as long as I darn blanket ends as often as I can. I dreamt I was knitting on Sunday night, so I decided that must be what I really want to do next. I used my nostepinne for the first time and find the centre pull wool ball fab. I’ve always unwound from the outside and the balls jump out of the yarn bowl. No movement at all with a centre pull. It just sits quietly making no trouble at all. 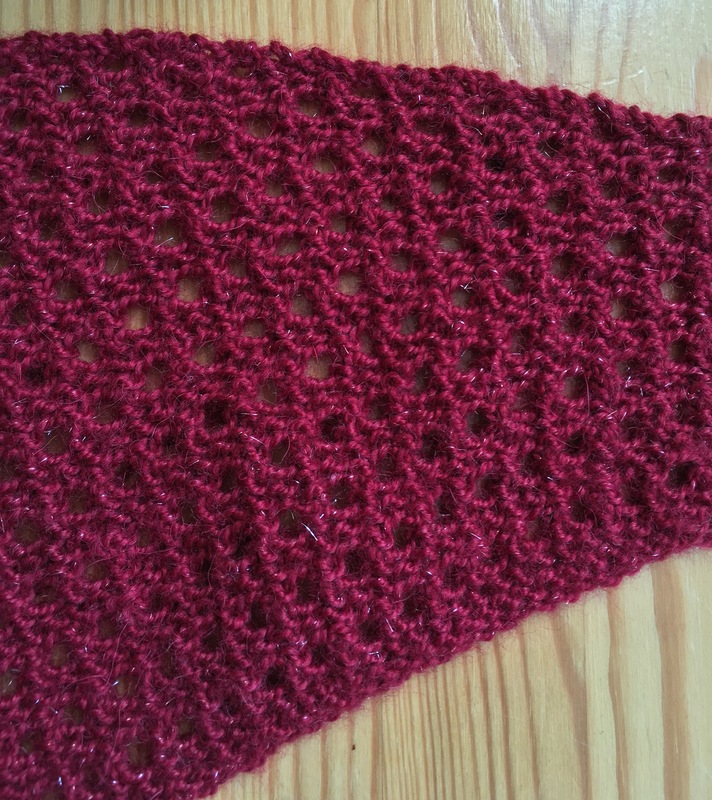 I’m knitting a gorgeously soft scarf with sparkley Louisa Harding Orielle (in ruby) which is 97% baby alpaca. You increase a stitch at one end and decrease a stitch at the other. 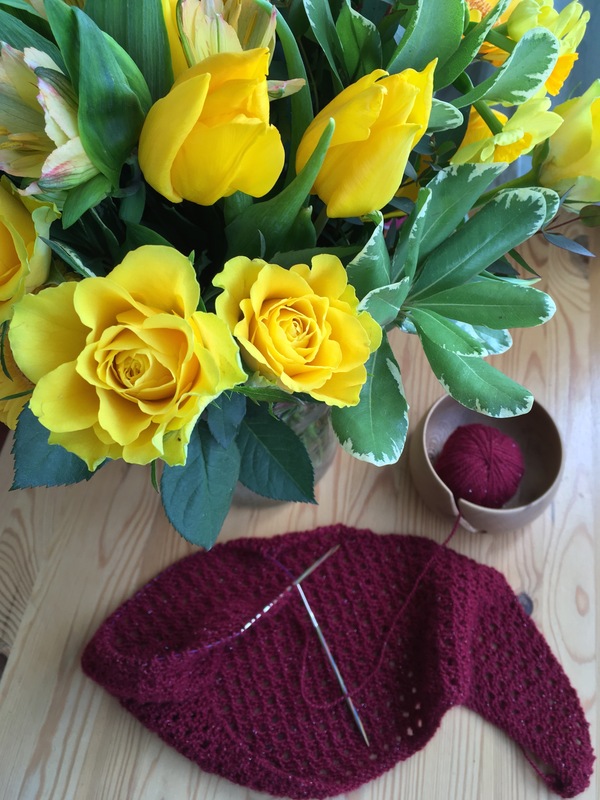 There’s a lot of plain knitting involved which might get dull, but hasn’t yet. I started with 72 stitches and realised I should check that I still have 72 . There were 66!?!? How did that happen? This is fairly typical of me and knitting. I think it’s all very straightforward, and just in case I get muddled I use a row counter app, but it always goes astray somehow. The perfectionist in me is tempted to rip it all back, but the voice of reason says “It’s only a scarf, get over it. Just add 2 increases until it’s 72 again.” Alright then! I’m about to start listening to The Silent Tide by Rachel Hore. I liked A Gathering Storm and enjoyed Gerri Halligan’s narration before, so am looking forward to it. PS: I finished We are all Completely Beside Ourselves (see here) and quite enjoyed it in the end. I did read another novel after the spoiler and before continuing though. I’m joining in again with Ginny’s Yarn Along. I’ve just started this audio book: A Gathering Storm by Rachel Hore. It’s one of my favourite kinds of stories; a family mystery, an old English Manor House and a picturesque Cornish seaside town. 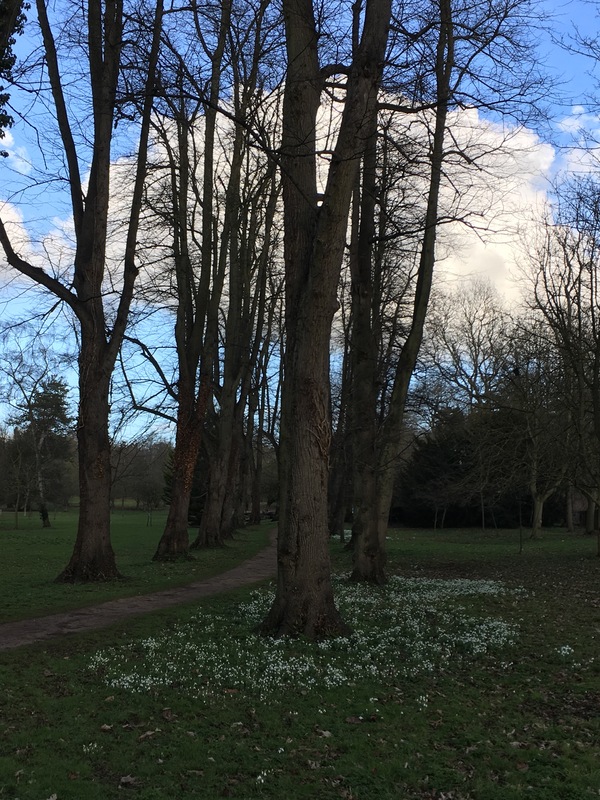 As well as crocheting to audio books I also love walking while listening. This morning I strode along in the lovely bright sunshine listening to the first few chapters. It’s a very promising start. I haven’t read anything by this author before and hopefully I’ll enjoy this book. I see she’s had quite a few books published; it’s good to find someone you like and read their back catalogue. Can you see that this baby hexagon piece is finally beginning to look rectangular? It’s proper fiddly and slow crochet. 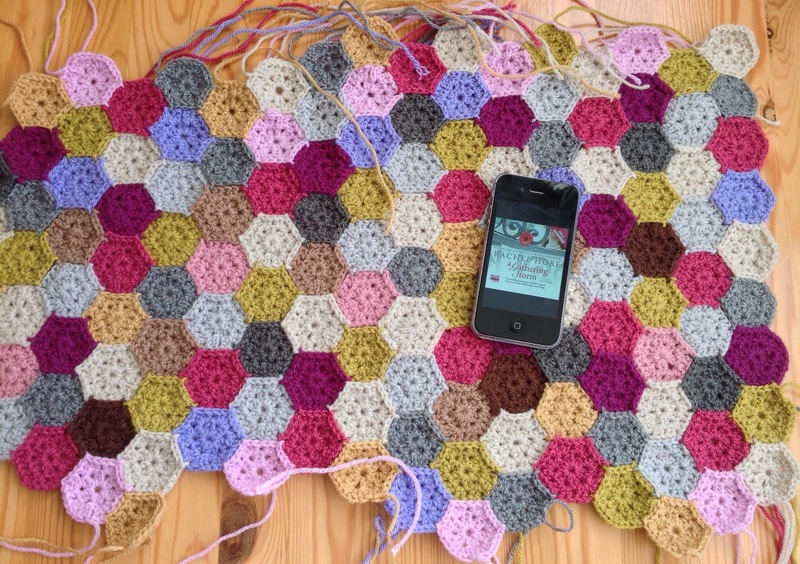 I’d definitely like to make hexagons again, but I won’t be joining them as I go again. I want the sides to lie neatly together, the way these look are still making me feel irritated. Larger hexies would make a more drapey fabric too. I’m joining in with Ginny’s Yarn Along again.